JD Sports, a leading trainer and sports fashion retailer in the UK, commissioned Entec Design Services Ltd., a specialist building subcontractor that designs, supplies and installs roofing, cladding and curtain wall systems, to undertake design work at its Fort Kinnaird store. 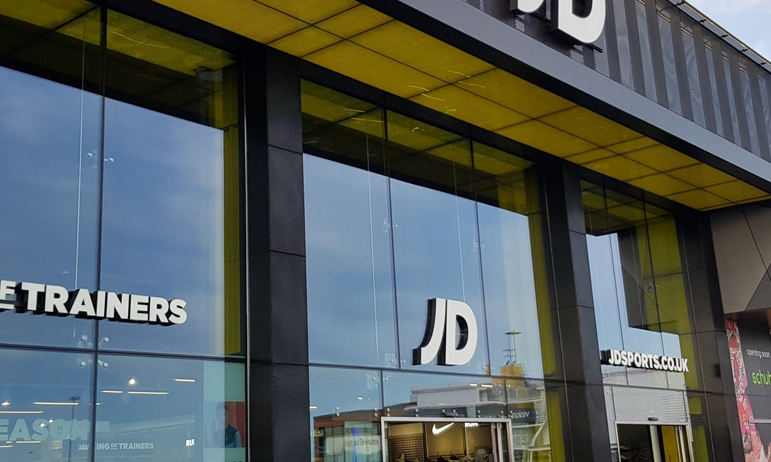 Entec Design Services Ltd. requested a specific metal mesh to be used at the front of the JD Sports’ signage box in Fort Kinnaird. The product needed to meet strength and aesthetic specifications and align with the structural integrity of the JD Sports site. We supplied a large number of samples to enable Entec Design Services Ltd to choose the appropriate product for the project. It was established that Mild Steel Flattened Mesh 2077F would meet the requirements of strength, size and aesthetic appeal. Our team of engineers also provided close support to the Entec team. Alan Clayton, technical director at Entec Design, said: The Expanded Metal Company provided a professional service, and a fantastic end product with a series of visuals that JD Sports is happy with. We look forward to working with the company again in the future.